It’s hard to believe that it’s been 2½ months since I’ve blogged. In June, I hurt my left arm that left it in a sling for a week and a half. Then I went on a slew of business trips, I started twittering, and I posted tons of photos (as usual). Looks like blogging got squeezed out. But recently I got a new toy: an iPhone. One of the apps I’ve installed on it is WordPress, so I no longer have to be sitting in front of a PC to blog. It’s too soon to say if this will encourage me to blog more — let’s see if it does. 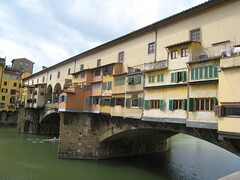 Here are some stats about the photos I took during my recent trip to Florence for CHI 2008. I took 934 photos and videos, kept 907, and uploaded 504. But if you don’t want to experience my trip in real time, you can see my highlights with 350 items, or my super-duper-highlights with only 72 items, a full 92% off the original size!